This is one of my favorite books. From 1980, but as relevant now as it was then. At one time or another on the road of life, all of us have arrived at a crossroads in our thinking. Practicing medicine has brought me there, perhaps an illness will place you there too. As I have seen the options, we may, on the one hand, choose to respect and appreciate nature. We may see within her a wisdom and intelligence that far surpasses man’s greatest technological achievements. We may come to realize that man’s best interest is served through obedience and conformity to nature and that sound health is the result of this obedience. On the other hand, we may choose to believe that we can improve upon nature, that we can manipulate her to our own benefit. We may believe that we are responsible for nothing but our own pleasure, that we may freely violate and disregard natural law and then artificially manipulate the deleterious consequences. We may believe we can eat poorly, sleep rarely, work constantly, exercise sparingly and avoid any physical consequence by the use of some wonder drug or miraculous surgery. It is evident that this is the road most of us choose, for during the 1900’s the volume of drug business in the United States has increased by a factor of 100. It is estimated that 20,000 tons of aspirin are consumed per year, or 225 tablets per person. Not only is the drug industry booming, but also, as everyone already knows, there has been a tremendous increase in health care costs. To live indiscriminately and pay the price later is easier – for the moment. Maybe that’s really why we choose it. It requires no discipline and no sacrifice. It conforms to our cultural pleasures. ln my medical practice, I see many whom no drug or surgery will restore to health. The hoped-for escape becomes only a means to muffle the most noxious complaints or a method to prolong a dying existence. For all advances in science, we still remain humbly, pitifully dependent upon the forces of nature: air, water, food, and sunlight. It seems in fact, the more advanced our technology becomes, the more capable we are of destroying ourselves – not only by a nuclear holocaust, but also by more insidious inroads into our health such as the tremendous change that has taken place in the area of food technology. Death has always been easily within man’s grasp, while life and health remain the property of nature and her forces. Out of this conviction, this book has been written. 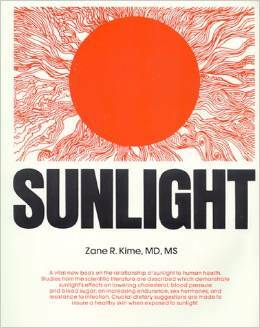 I believe there is ample evidence in the scientific literature that sunlight, free of technological distortions, is not only beneficial, but necessary for human health.